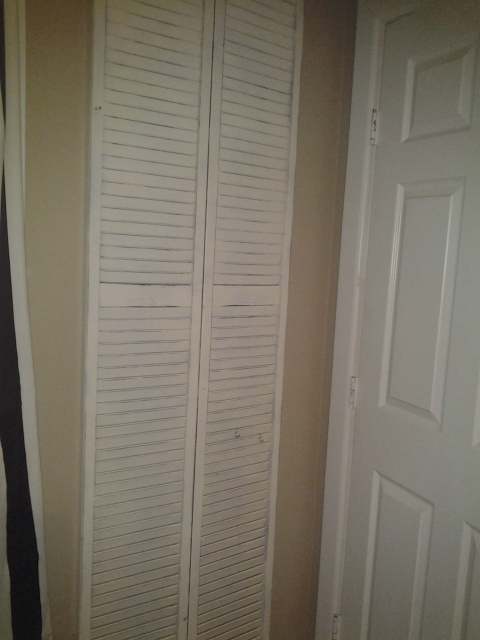 Not only did my in-laws give me a great boy to marry, they also gave me these great shutters! I put them both to good use tonight! 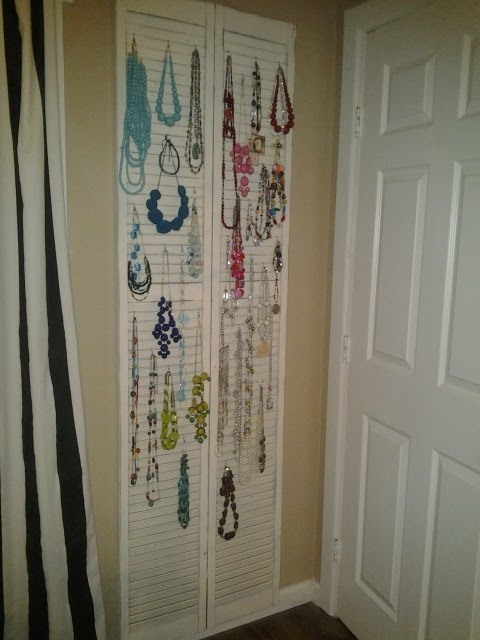 Marcus hung the shutters and the shutters are hanging my necklaces! 2 1/2 years ago! They have lived in my front hall closet for far too long! So now they are hanging behind my bedroom door. Visible to me, but nobody else will really see them. I just used S hooks to hang them. Easy Peasy! I first used the shutters in December at a craft show! I spray painted them with Rustoleum Heirloom White. That stuff is magic! 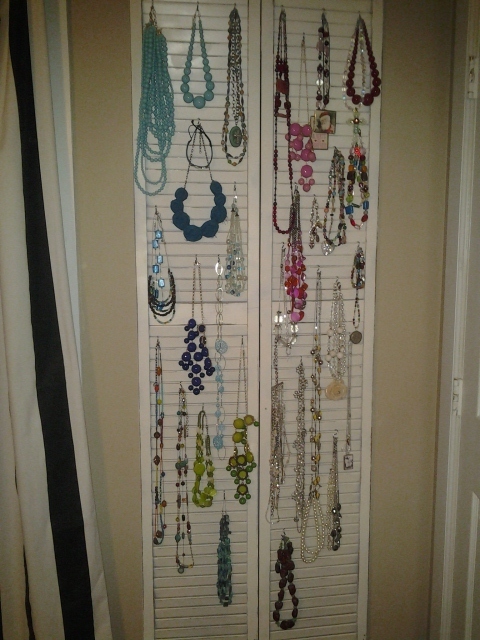 I guess I need to buy more jewelry to fill that other set of shutters too! 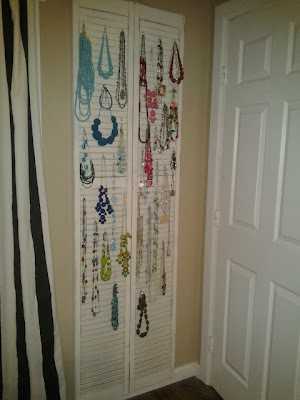 I have a couple of shutters that would be great to use, but I don't have many necklaces. Maybe I could hang my purses, or scarves or something?? You are my jewelry hero and that display looks like a little piece of heaven! 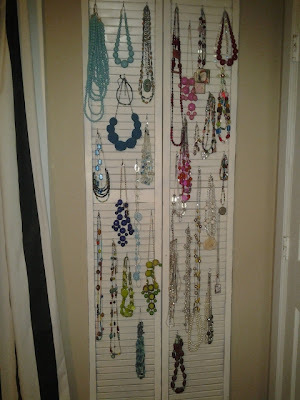 What a brilliant idea for display the jewelry sets. You have many kind of jewelry sets i mean necklaces. I think it would be very easy to choose the necklace because all the necklaces before your eyes. Good job. Is this your living room where you jewelry placed? I also planned for like this room, first i want to purchase living room furniture and then i will decide which place is for my jewelry. I will definitely share with you people. Heirloom white is the best! I used (13 cans) on redoing my dining room chairs. They looked great & my pointer finger eventually got its feeling back after all that spraying! !